Shihan Trujillo started his martial arts training at the age of 21 in 1983. Shihan Trujillo had his first class with Shihan Rudy Amaya ( currently 8th degree blackbelt) at Red Dragon Karate in San Dimas. Shihan Trujillo quickly became a dedicated and enthusiastic martial artist and soon found himself as Shihan AmayaÆs top competitor and student. In the years that followed he managed Shihan Amaya's school and eventually purchased the San Dimas studio from Shihan Amaya in 1989. Shihan Trujillo later became the owner of Red Dragon Karate in Covina, when then Green Power Ranger Jason Frank sold the school. Over the years, Shihan Trujillo has trained several top tournament competitors, including Sensei Carlos Trujillo, Sensei Edward Williams, Sensei Ryan Moya, Sensei Henry Rodriguez, Sensei Matthew Hernandez, Sensei Rodrigo Llanger, Sensei Lisa Lavarias Freibott and many more. His San Dimas Demo Team trains every Friday and performs 15-20 demonstrations a year. Team San Dimas has performed at places like the LA County Fair, KnottÆs Berry Farm and local schools, churches and grand openings. Shihan Trujillo has trained under Shihan-Sensei Louis Casamassa and Shihan Michael Jablonski. He has worked with business coaches in the martial arts including Greg Silva of United Professionals, Barry VanOver of Premier Martial Arts; and Paul Garcia America's Best Defense. He credits his success and continues to receive the guidance of personal mentors such as his Pastor Jim Reeves from Faith Community Church and Shihan Amaya. Shihan Trujillo likes to bring a fresh outlook to his martial arts studio. He has created a place students where students can come to train in their martial arts and be part of a close-knit family atmosphere. If any student needs to talk, even if its about something personal, Shihan Trujillo takes time to listen and to advise the student on practical courses of action. He makes each student feel important, special and cared about. Shihan Trujillo has a close relationship with his church, Faith Community Church in Covina, CA where youÆll find several members of Chozen Martial Arts San Dimas attending. 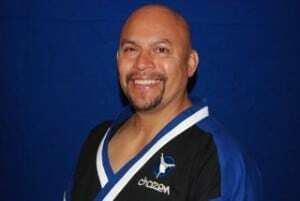 With his strong Christian background, Shihan Trujillo has the strength to lead ethically with integrity and honesty and seeks to instill these same qualities in those who study at Chozen. He goes to great lengths to bring in speakers and materials to train his students, always looking to provide skills that will help them cope and create a better life for themselves. This theme runs through his training of students on the dojo floor too, where he inspires each student to reach their maximum potential as a martial artist. Shihan Trujillo is recently married Heather James which brought the ôTrujillo Bunchö together in one home, with Bobby Trujillo, Danielle James and Tyler James. He gives thanks to his Savior Jesus Christ and his family, students and instructors at Chozen Martial Arts.